May be or may be not??? While you can’t predict when an emergency will occur, you can be prepared. In less time than you think, First Aid to Save a Life can give you the vital knowledge and skills you’ll need to respond to a life-threatening situations with confidence. This training program is designed specifically for families. Now you and your family members can learn to provide the best care possible in your own home/venue when it’s convenient for you. 82% of parents would not know what to do if their child started choking, burned themselves or even stopped breathing. Do you know? Do you know the difference between cardiac arrest and heart attack? 83% of minors and young adults would feel more confident helping those around them if they were taught First Aid. 70% of out-of-hospital (OHCA) cardiac arrest occurs at home/residence. Do you know what CPR/AED is? Do you know CPR for adult/child/infant or how to use AED? 85% of minor and young children drowned in their home/residence. Do you know how to save them in future? Falls, burns & poisoning are among the leading causes of death and injuries of children up to the age of 14. Do you know how to stop bleeding or administer required first aid? First Aid for parents is essential, it is vital to know what to do in an emergency situation. You are kindly requested to disseminate this flyer to others so that they can positively participate in this training program. First Aid is for everyone, everywhere. 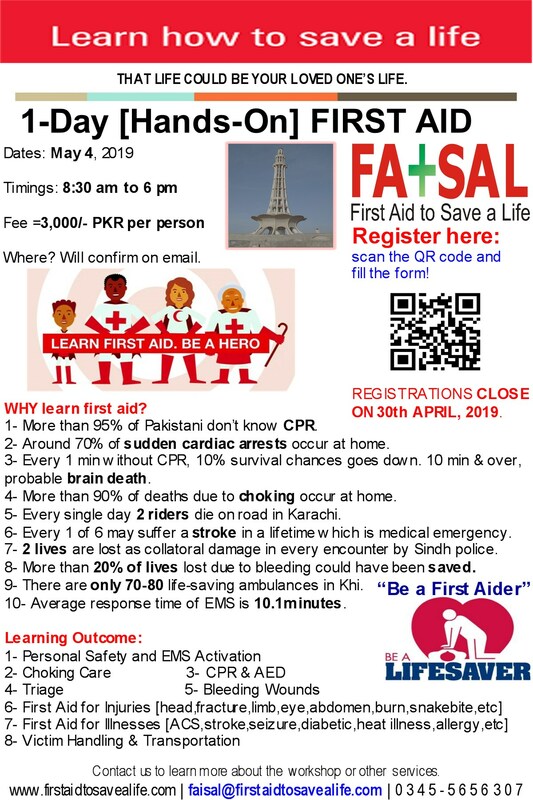 This entry was posted in First aid for Families, medic first aid international and tagged 1-Day Training Programs, 2014 training course, 2015, 2015 trainings, 2017, 2018, ABC of Resuscitation, accredited first aid and cpr trainings, Accredited first aid training companies, Accredited first aid training courses, accredited first aid trainings in pakistan, accredited training program, advance first aid, advance first aid training courses, Advanced First Aid, Advanced First Aid with Extensive Practical, AED, AED Implementation Program, aed training, aed training programs, aed trainings in pakistan, AEDs, AHA, AHA First Aid Training Courses, American heart association, anti snake venom vials and pressure bandage, anti-snake venom vials, ARC First Aid Training Courses, automated external defibrillator, basic first aid, Basic First Aid and tagged 1-Day Training Programs, basic life saving skills, bleeding control techniques, blood loss, Cardiac arrest, Cardio Pulmonary Resuscitation, Certified First Aid Instructors, Certified First Aid Trainings, community courses, control of bleeding in snakebites, conventional CPR training vs online CPR class, courses, CPR, cpr and aed, CPR and AED for Adults, cpr and aed for all, cpr training, cpr trainings, cpr trainings in lahore, defibtech aed, difference between heart attack and cardiac arrest, discount offers, discount offers on trainings, emergency care and first aid, emergency first aid, Faisalabad, family first aid, familyfirstaid, first aid, first aid and cpr, first aid courses for free, first aid courses in 2017, First Aid CPR and AED, first aid cpr and aed training in faisalabad, first aid cpr and aed training in hyderabad, first aid cpr and aed training in islamabad, first aid cpr and aed training in karachi, first aid cpr and aed training in kohat, first aid cpr and aed training in lahore, first aid cpr and aed training in Pakistan, first aid cpr and aed training in peshawar, First Aid CPR and AED Trainings in Faisalabad, First Aid CPR and AED Trainings in Gujrat, First Aid CPR and AED Trainings in Islamabad, first aid cpr and aed trainings in karachi, First Aid CPR and AED Trainings in Lahore, first aid cpr and aed trainings in multan, First Aid CPR and AED Trainings in Pakistan, First Aid CPR and AED Trainings in Punjab, first aid for adult, first aid for all, first aid for amputation, first aid for animal bites, first aid for asthma, first aid for baby, first aid for back injuries, first aid for bosebleed, first aid for brain injuries, first aid for breathing problems, first aid for burn, first aid for caregivers, first aid for chemical burn, first aid for children, first aid for choking, first aid for cold emergencies, first aid for concussion, first aid for dengue fever, first aid for ear injury, first aid for elders, first aid for electrical burn, first aid for everyone, first aid for fainting, first aid for fall from height, first aid for families, first aid for family, first aid for for not breathing, first aid for for seizure, first aid for fracture, first aid for frostbite, first aid for head injury, first aid for heart attack, first aid for heart failure, first aid for heat emergencies, first aid for heat exhaustion, First Aid for Heat Illness, first aid for heat stroke, first aid for hot water burn, first aid for ill people, first aid for infant, first aid for injured people, first aid for minor adults, first aid for parents, first aid for patients, first aid for sick peoples, first aid for snakebite, first aid for staff, first aid for steam burn, first aid for stoke, first aid for sun burn, first aid for toddlers, first aid for unresponsive, first aid for young adults, first aid in badin, first aid in faisalabad, first aid in hyderabad, first aid in islamabad, first aid in karachi, first aid in kohat, first aid in lahore, first aid in multan, first aid in peshawar, first aid in rawalpindi, first aid institute in islamabad, first aid institute in lahore, first aid institute in rawalpindi, first aid is everywhere, first aid is for all, first aid is for everyone, first aid is for everyone everywhere, First Aid Master Trainer, First Aid Program, First Aid Requirement Assessment, first aid to control bleeding, First Aid Train the Trainer Courses, First Aid Train the Trainer Courses in Karachi, First Aid Trainer, first aid training, first aid training and floods, First Aid Training Courses in 2016, first aid training courses in hyderabad, First aid training courses in islamabad, first aid training courses in karachi, First Aid Training Courses in Karachi Pakistan, first aid training courses in lahore, first aid training for fitness instructors, first aid training for fitness trainers, first aid training for gym instructors, first aid training for physical instructors, first aid training for physical trainers, first aid training for small businesses, first aid training for teachers, first aid training for teachers in Australia, first aid training for teachers in canada, first aid training for teachers in Gulf, first aid training for teachers in Kuwait, first aid training for teachers in Oman, first aid training for teachers in Saudia, first aid training for teachers in UAE, first aid training for teachers in USA, first aid training guidelines 2015, first aid training islamabad, First Aid Training Programs and tagged 1-Day Training Programs, First Aid Training Programs and tagged 2014, first aid training providers, first aid trainings for free, first aid trainings in 2015, first aid trainings in 2018, first aid trainings in islamabad, firstaidforfamily, flood and first aid training, free first aid courses, free first aid trainings in islamabad, free first aid trainings in Karachi, free first aid trainings in Lahore, Give Way to Ambulance, HAINES Position, haines recovery position, Hands-Only CPR, helping people save lives, hse courses in islamabad, HSE courses in pakistan, hse training courses in islamabad, hse training courses in karachi, hse training courses in lahore, ICRC Pakistan, Instructor Development Courses in 2017, international aed training courses, international cpr courses, international first aid courses, international first aid cpr aed training courses, international first aid training center in Afghanistan, international first aid training center in bangladesh, international first aid training center in Bhutan, international first aid training center in China, international first aid training center in India, international first aid training center in Iran, international first aid training center in Maldives, international first aid training center in Nepal, international first aid training center in pakistan, international first aid training center in Saudia, international first aid training center in UAE, international first aid training centers in asia, international first aid training centre in pakistan, international first aid-cpr-aed courses, International Training Certification Course, islamabad, Karachi, Lahore, latest aed guidelines, latest cpr guidelines, latest first aid guidelines, Latest first aid training guidelines, Latest first aid training guidelines of 2015, medic first aid international, MEDIC First Aid International Courses, Medic First Aid International in Karachi, MEDIC First Aid International Trainings in Faisalabad, medic first aid train the trainer, medic first aid trainings, modified haines position, national institute of first aid, new courses launched in 2014, occupational safety training institute pakistan, online CPR training, oxygen first aid for emergencies, Pakistan, Pakistan National Institute of First A, practical snakebite first aid training, practical snakebite first aid training in Pakistan, primary assessment, Promoting First Aid, save a life be a hero, Sindh, snakebite prevention and floods, social causes, spinal motion restriction, startup, startup business, startups in lahore, sudden cardiac arrest, training course, training for teachers in canada, training program, trainings, trainings in 2015, trainings in 2018, What does the American Heart Association (AHA) say about AEDs, what is cpr, what is primary survey, what is SCA, why 30 compressions. Bookmark the permalink.